After her family’s move to West Fargo, Judy began her 34-year career in the real estate business and continued to be involved in the community, including serving for 12 years on the West Fargo Planning and Zoning Commission. In 1994 she was elected to the ND Senate representing District 13, part of West Fargo. 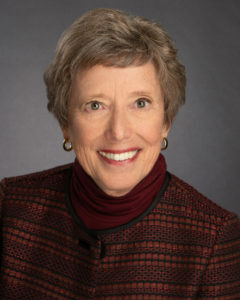 She has served on the Senate Human Services committee since 1995 and as chair since 2001. Judy also has been on the Political Subdivisions and the Government and Veterans Affairs committees. She was elected President Pro Tempore of the Senate in 2007 and served as chair of the Health Committee of the National Conference of State Legislatures in 2009. Foundation, ND Association of Realtors, ND Public Health Association, and ND Township Officers Association, among others. Judy and her late husband Duane have two children, Jon and Maren. Jon and his wife Billie Jean live in Plano, Texas, where both are educators. Maren, her husband Joe Matal, and their 3 children, John, Elizabeth, and Margaret, live in Bethesda, MD, where Maren and Joe are attorneys. If you are in West Fargo/Fargo, please join Senator Judy Lee and other local legislators in participating in a public forum. There you can ask questions and hear where the legislature is at as they begin to wrap things up.